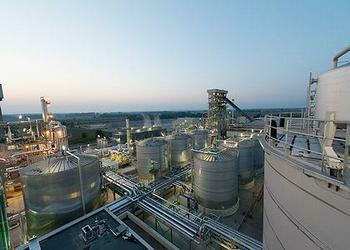 CRESCENTINO, Italy, October 14, 2013 (ENS) – The world’s first commercial-scale refinery to produce bioethanol from agricultural residues and energy crops has opened in northern Italy. When fully implemented, the system will provide 75 million liters of bioethanol annually for the European market. Present at the opening Wednesday were Italy’s Economic Development Minister Flavio Zanonato, local and regional officials and representatives from the European Commission, as well as more than 500 stakeholders from around the world. 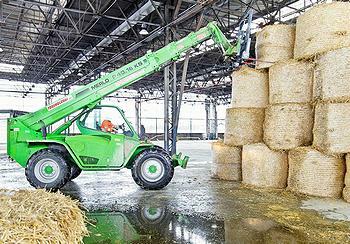 Situated in fields outside the city of Crescentino, the plant uses wheat straw, rice straw and arundo donax, a high-yielding energy crop grown on marginal land to produce cellulosic ethanol, using enzymes to convert the plant material into fuel. The facility is the result of a collaboration between Beta Renewables, a cellulosic biofuels company based in Tortona, Italy, and Novozymes, the world’s largest producer of industrial enzymes, headquartered in Denmark. Lignin, a polymer extracted from biomass during the ethanol production process, fuels an attached power plant, which generates enough power to meet the facility’s energy needs. Any excess green electricity will be sold to the local grid. Since 2011, more than US$200 million has been invested in research and development of the technology used to produce cellulosic ethanol at the Crescentino facility with financing from the Texas Pacific Group. Proesa belongs to the so-called “second-generation” technologies which allow the use of the sugars present in lignocellulosic biomass to obtain fuel and other chemicals with lower greenhouse gas emissions and at competitive costs compared to fossil fuels such as oil and natural gas. A recent study by Bloomberg New Energy Finance concludes that transforming agricultural residues into advanced biofuels could create millions of jobs worldwide, economic growth, reduction of greenhouse gas emissions, and energy security by 2030. But before this can occur, Ghisolfi and Nielsen say government support is necessary to accelerate the deployment of next-generation biorefineries. Italy’s government is hearing this message. Zanonato and Environment Minister Andrea Orlando responded on the facility’s opening day with a decree that promotes the creation of new biorefineries. The decree simplifies the procedures for authorizing biorefineries, with the dual purpose of promoting them in Italy and facilitating investments in the industry.